533 mm Mk143 х 4 pcs. Mahan is a fairly well-rounded destroyer by the standards of the class. She is the first American destroyer to have the capability to fire torpedoes from beyond her detection range — via the upgraded torpedoes she has access to upon equipping Hull (B) — as well as sporting a solid pool of hit points and fast firing guns that turn quickly. Overall, Mahan is good at almost anything her enemies can throw at her (with the possible exception of aircraft). She is able to defend herself from enemy destroyers adequately; even more so once she gains additional hit points from upgrading to Hull (B). Her upgraded torpedoes are somewhat slow, but hit decently hard and can be fired from stealth. One thing of note about her torpedo launchers: she has one port, one starboard, and one centerline. This allows her to put a very respectable eight fish into the water on either side; however, many opponents forget about the odd launcher on the opposite side of the ship. It can make for a nasty surprise at close range if they believe that she's launched all of the torpedoes she had loaded. Mahan’s primary weaknesses are her large detection range and enemy aircraft; Hull (C) can assist with the latter by allowing captains to trade Engine Boost ( ) for Defensive AA Fire ( ). Lacking access to Upgrade Slot 5, there is little that Mahan can do for her large detection radius other than spend commander skill points on Concealment Expert; even then, her detection radius is still over 7 km. Overall, Mahan is a definite upgrade from Farragut and a solid Tier VII destroyer. Outstanding main battery rate of fire. Three torpedo tube launchers provide additional flexibility and will frequently catch opponents off-guard. Large health pool for a destroyer. Long range torpedoes reach out to 9.2 km, making her the first American destroyer capable of firing torpedoes from beyond her detection range. Has access to the Defensive AA Fire ( ) consumable with Hull (C) equipped. Anti-aircraft guns are mainly for show and will rarely shoot anything down, even with the later hull upgrades. Large silhouette and a fairly large detection range. Shorter main battery range compared to Farragut. Slowest Tier VII destroyer at 35.4 knots. Hull: Upgrade to Hull (B) for additional health and improved rudder shift time; researching Hull (B) unlocks progression to Benson. Equipping Hull (C) removes one main battery gun (and comes with a corresponding reduction in anti-aircraft firepower), enhances her short-range AA suite, and allows Mahan to equip Defensive AA Fire ( ). Torpedoes: The Mk15 mod. 0 torpedoes don't hit quite as hard and also travel slower, but they have far more range than her stock fish. Hull (B) must be equipped before they can be installed. Gun Fire Control System: Upgrade to Mk7 mod. 2 for an extra 10% range on the main battery. Hull (B) is the best place to invest early gains in Mahan; the additional hit points will increase her survivability immeasurably. The Torpedo upgrade is the next best place to spend experience gains; pick up the Fire Control System upgrade last. Hull (C) follows the pattern from Farragut of allowing access to the Defensive AA Fire ( ) consumable by sacrificing one of the main battery turrets. This is an optional upgrade for captains who wish to maximize their defenses against enemy aircraft and is probably best either skipped or acquired after unlocking Benson. Upgrade options are pretty thin on the ground for Mahan. Main Armaments Modification 1 is the best choice for Slot 1. Slot 3 is fairly well restricted to Aiming Systems Modification 1; AA Guns Modification 1 ( ) is a waste of time given how anemic Mahan’s suite of anti-aircraft guns is. Slot 2 and Slot 4 are best given over to Propulsion Modifications 1 and 2, respectively, in order to preserve Mahan’s mobility when under fire. Level 1's best choice is Preventative Maintenance, as it reduces the chance of Mahan having her engine or rudder knocked out while under heavy fire. Last Stand is the best of the lot at Level 2; Mahan captains will find themselves under enemy fire frequently, and losing her engine is the worst possible module knockout she can suffer. Concealment Expert is clearly the best option at Level 4. Level 3 offers a ton of great skill choices: Basic Firing Training improves Mahan’s abysmal anti-aircraft DPS as well as improving the rate of fire of her main battery guns; Survivability Expert adds more than 17% extra health; Vigilance allows her to better screen her allies from enemy torpeodes; Superintendent provides extra charges of valuable consumables; Demolition Expert increases the damage potency of her main battery. None of these are bad choices, but Survivability Expert should be the first one chosen. A dead Mahan does no damage, after all. Equipping Damage Control Party II ( ) is worth the credits (or doubloons) for the shortened cooldown on repairing broken modules. Engine Boost II ( ) or Defensive AA Fire II ( ) aren't really worth the investment; stick with the free version of whichever one is chosen. 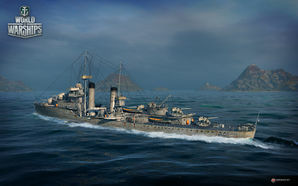 Players who wish to spend doubloons can equip Mahan with Type 17 camouflage that lowers her detection radius, reduces the accuracy of incoming shells, reduces her repair costs, and increases the amount of experience she earns. Equipping Sierra Mike ( ) is an excellent way to help make up for Mahan’s deficiency in maximum speed. Captains should also consider Victor Lima ( ) and India X-Ray ( ) signals to increase the fire chance of her main battery shells, though they should be paired with a Juliet Charlie ( ) to ensure that Mahan doesn't detonate under enemy fire. The Mahan class were a series of 18 destroyers built between 1934 and 1937. Developed from the Farragut class, the chief improvements were an increase in torpedo tubes, superimposed gun turrets, emergency generators and an improved steam turbine system. Six ships were lost in combat and two were used in the Operation Crossroads nuclear test. No examples survive today. Launching of USS Mahan (DD-364), 15 October 1935. Mahan undergoing builders' trials, circa 1935. Mahan completing sea trials, summer 1936. Mahan underway, 8 February 1938. Mahan off Mare Island, California, 1 May 1942. Mahan off Mare Island, California, 21 June 1944. Her camouflage design is Measure 31, Design 23d. Undergoing refit at Mare Island, California, 24 June 1944. Circled areas indicate modification accomplished by the yard during the overhaul. This page was last modified on 19 February 2019, at 03:54. This page has been accessed 56,941 times.